Who are the UK's foreign workers? On New Year's Day, construction worker Victor Spiresau was greeted by politicians, reporters and photographers at Luton Airport - the first Romanian immigrant to arrive in Britain after the controversial lifting of employment controls on Romania and Bulgaria. Victor became the reluctant symbol of what many predicted would be a vast wave of East Europeans flocking to the UK. MPs and newspapers warned of a "flood" of hundreds of thousands of poor Romanians and Bulgarians who would strain our welfare system and public services. It was an argument that played directly into anxieties about immigration and the influence of the EU. But today's figures, the first official estimate of workers from Romania and Bulgaria since the transitional employment restrictions were removed on the so-called A2 countries in January, suggest there has been no flood. If anything, the reverse. 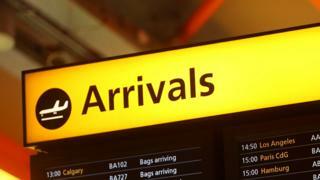 There were an estimated 144,000 Romanian and Bulgarian workers in the UK at the end of 2013. Now the respected Labour Force Survey puts the figure at 140,000 at the end of March - 4,000 fewer people from A2 countries estimated to be working here since controls were lifted. The figure is still 29,000 higher than the number estimated for the same period last year, but that rise occurred while employment restrictions were still in place. The argument that lifting them would lead to huge extra numbers coming here from Romania and Bulgaria is not reflected in official figures. However, the numbers do demonstrate a long-term rise in workers from the A2 countries coming to the UK. Back in 2001, the Labour Force Survey estimated there were only around 6,000 citizens from those countries employed in Britain. Numbers grew steadily as the former communist states developed closer relationships with the West, and after they were invited to join the European Union in 2007, 100,000 more Romanian and Bulgarian workers came in just six years, despite "transitional" employment controls. But today's figures are a reflection of a wider phenomenon. There has been a significant increase in the number of workers from many other EU countries coming to Britain in recent months, notably the A8 countries including Poland, the Czech Republic and Latvia. The first three months of this year saw a jump of 74,000 in the number of workers from those eight accession countries compared with the last quarter of 2013. Year-on-year, the increase is 115,000 - one of the highest increases seen since Poles first started coming to the UK in large numbers in 2004. Overall, the number of workers from elsewhere in the EU has risen 168,000 in the past year - mobile labour attracted by the impressive employment situation in the UK. Here, of course, is the real issue. People will tend to move to places that offer better prospects, and within the European Union that freedom is enshrined in the EU Treaty. Image caption Home secretary, Theresa May: UK "committed to freedom of movement." "Freedom of movement in Europe is one of the central achievements of the European integration process and one of the most important and visible benefits of the European Union for its citizens," the Home Secretary Theresa May stated in a letter last year. "We are fully committed to the common European right to the freedom of movement. We will always welcome Union citizens who move to another EU country to work." However, the UK is not alone in questioning the impact this freedom can have on welfare and public services, particularly for a country that outperforms other parts of the EU economically. The government is tightening up access to some benefits for EU citizens where permissible, and looking to renegotiate the rules still further. The letter signed by Mrs May was sent to the President of the European Council for Justice and Home Affairs jointly with representatives from Austria, Germany and the Netherlands. Among richer and more economically stable countries within the EU, there is a shared concern that positive headlines about financial success are matched by troublesome headlines about immigration. Today's Labour Force Survey figures show that the UK's employment rate has risen to probably its highest ever level among domestic workers - 72.8%, marginally higher than the figure for non-UK citizens (69.5%). While the number of foreign-born citizens working here has risen 178,000 in the past year, the number of UK citizens in employment is up 563,000. A remarkable 400,000 fewer people are claiming unemployment benefits in the UK compared with a year ago - a massive 26.4% drop. It is impressive numbers like these that explain why workers in many other EU countries think Britain might be a good place to look for a job.